I was inspired the other day to take another look at the Walesville, New York jet crash in which four people were killed. This incident has been attributed to a UFO in the area. What got me started on this was that I was working on my presentation for the August MUFON Symposium in Denver, and I was using, as an example of scientific research something that Barry Greenwood had done with the film of two UFOs over Great Falls, Montana. I remembered that Greenwood, along with Larry Fawcett had mentioned the Walesville case and had attributed to me some information that more properly belonged to Jacques Vallee. Convoluted enough for you yet? So, let’s take a look at this and see what we can learn by accessing some of the sources that are available to us in today’s world. First, we need to take a look at the basics of the case. According to various UFO writers and researchers including Donald Keyhoe (Aliens from Space pp 26 – 27), on July 1, 1954 "an unknow n flying object was tracked over New York State by Griffiss AFB radar. An F-94 Starfire jet was scrambled and the pilot climbed steeply toward the target, guided by his radar observer. When the gleaming disc-shaped machine became visible he started to close in." Keyhoe (seen here) continued, "Abruptly a furnacelike heat filled both cockpits. Gasping for breath, the pilot jettisoned the canopy. Through a blur of heat waves he saw the radar operator bail out. Stunned, without even thinking, he ejected himself from the plane." Keyhoe then noted, "The F-94, screaming down into Walesville, N.Y., smashed though a building and burst into flames. Plunging on, the fiery wreckage careened into a car. Four died in the holocaust – a man and his wife and their two infant children. Five other Walesville residents were injured, two of them seriously." If all this could be factually established, that is, the jet crashed as a result of the actions of a UFO, then we have big news. UFOs aren’t just harmless lights in the sky, but can result in tragedy on the ground. Keyhoe wasn’t alone in his belief of a UFO attack on an Air Force interceptor. Otto Binder, writing in What We Really Know about Flying Saucers (1967) suggested that it was the radar officer who was saw the UFO and pointed it out to the pilot. The pilot turned the aircraft to get a better look and when the cockpit filled with heat, both men bailed out. Binder claimed that both men were interrogated at length by Air Force investigators who concluded that they were not responsible for the crash. According to Binder, there was only one source for the heat and that was the UFO. Binder said that his account was based on Air Force Records, which is true, to an extent. There was also a great deal of interpretation in Binder’s account. J. Allen Hy nek (seen here) and Jacques Vallee, in The Edge of Reality (1975) discussed the case. Vallee suggested that there had been a dense cloud cover and that the UFO had been picked up on radar. Two jets were scrambled, one that remained in the clouds and the second that climbed to a higher altitude. When it broke through into clear sky, the pilot saw the UFO coming at him. The cockpit filled with heat and both men believe the aircraft was about to burst into flames. They bailed out and landed safely, but the aircraft crashed into Walesville. Hynek said the case wasn’t documented but Vallee said, "Yes, it is documented. It was even mentioned in the New York Times the next day." UTICA. N.Y., July 2 (AP) – A silvery, balloon-like object floating over the Utica area tonight sent residents rushing to their telephones to make inquiries of newspapers, police and radio stations. The Utica Press estimated that more than 1,000 calls about the object jammed its switchboard between 6 and 10 P.M. It was reported by residents in a twenty-five mile radius extending from Rome on the west to Frankfort, east of Utica. theorized that it was making a gradual descent and said that if it was still in in the area tomorrow morning a plane would be sent to investigate. A Mohawk Airlines pilot estimated the altitude of the object at about 20,000 feet. He said he saw a light apparently shining from it. For some reason, Keyhoe and some of the others have given the July 1 date for the balloon sighting and sometimes for the jet crash as well. A confusion of the two events might explain how the description of a disc-shaped object originated. Since both incidents were reported in the same general area and on the same day, the confusion is understandable. The Project Blue Book files tell the jet-crash story in a slight different way from that given by Keyhoe, Vallee and others. Neither incident is part of Blue Book’s official record. The index for Blue Book, which does list the accident, also notes it is "info" only, and lists the "witnesses" as Len Stringfield and others. I suppose I should point out that Stringfield, living in Ohio, did not make an on-site investigation and didn’t witness the incident. He reported it in his newsletter and that is what made him a "witness" in the Air Force file. The F-94C took off at 11:05 AM EST for an operational training mission out of Griffiss Air Force Base, New York on 2 July 1954. The aircraft was only a few miles out when the Griffiss control tower operator called the pilot to advise that he was being diverted to an active air defense mission. A vector of 60 degrees and 10,000 feet altitude was give to intercept an unidentified aircraft. The pilot experienced some difficulty finding this aircraft and the controller informed him of a second unidentified aircraft in the area. This aircraft was [subsequently] identified [by the pilot] as an Air Force C-47, tail number 6099. At this time there were no indications of F-94 malfunctions as stated by the pilot and the C-47 pilot. What this te lls us is that the unidentified object was later identified as a C-47. The F-94C (seen here) was not, in fact scrambled to intercept a UFO as suggested by some, but was already airborne when diverted to the mission. However, it is true that the aircraft was asked to identify an unknown target, which, in layman’s terms is a UFO. The ground controller gave the F-94C pilot a heading of 240 degrees as a vector back to the first unidentified aircraft. The F-94C was at 8,000 feet, flying about the tops of broken clouds, so the pilot started to descend below the clouds. It was evident that the unidentified aircraft was going to Griffiss Air Force Base. During the descent there was intense heat in the cockpit and the engine plenum chamber fire warning light came on. The pilot shut down the engine and the light remained on. Due to critical low altitude and the fire warning, the pilot and the radar observer ejected and were recovered without injury. Clearly, based on this, the other UFO, the one the pilot couldn’t find at first, was in the traffic pattern for the Air Force base. The identity, though not established by the pilot, was by the tower crew and the mission had ended. The UFOs were both military aircraft. I think this is where the idea there were two jets involved came from. There were two attempted intercepts but by only one aircraft. I have seen notations suggesting a second jet, but the evidence doesn’t bear this out. The other point that needs to be made here is that there was not a dense cloud cover. The term, "broken clouds" relates to the portion of the sky obscured by clouds. This means there were some clouds but they did not obscure the whole sky, and given the various altitudes for those clouds, it could have meant that from the cockpit, little of the sky was hidden. The reported ended, "The aircraft traveled about four miles from the point of ejection and, while on a heading of 199 degrees, crashed into the Walesville intersection at 11:27 AM EST. The aircraft struck a dwelling, killing a housewife and injuring her daughter, then struck an auto at an intersection, killing all three occupants." The Air Force report says nothing about the aircraft being scrambled, a disc-shaped UFO, or a heat ray, as alleged by some UFO writers. There is, in fact, no reason to suggest that this case has anything to do with UFOs, other than the assumptions made by Keyhoe in the 1950s and those who followed after that. Keyhoe, in fact, gets the identities of the civilians killed wrong. According to the New York Times for Saturday, July 3, 1954, "Those killed were Stanley Phillips, 38, his wife, Florence, 32, and their son Gary, 11, all of neighboring Hecla, and Mrs. Doris Monroe, 28, occupant of one of the houses." The Air Force conducted an investigation into the accident, but this report was sealed for many years. Given that the Air Force-sponsored University of Colorado UFO study, popularly known as the Condon Committee, had access to many official documents, it may not be surprising they did not create a UFO file for this incident because there was no UFO involved. With or without a UFO, there is the question of what caused the heat in the cockpit. Was there a fire on the F-94C, and if so, what caused it? Was the malfunction of the aircraft in any way mysterious? Investigation revealed the primary cause of the accident to be a malfunction of the aircraft fire detector circuit. The cause of the malfunction could not be determined. The pilot’s decision to abandon the aircraft was consistent with the emergency instructions contained in the F-94C Flight Handbook. A thorough examination of the plane’s air conditioning and pressurization system indicated no evidence of smoke, fuel, or oil, which would have been generated by a fire. The pilot had flown the aircraft on a previous flight that same day and had found it necessary to adjust the cockpit temperature manually several times. The air vents were set so that pressurized air was being directed into the cockpit. The report suggests that "Inasmuch as the pilot acknowledged changing the engine power settings and flight attitude during his attempted second interception, it appears that the pilot interpreted a normal, non-automatically controlled temperature rise as an overheat cockpit condition. Since there was no evidence of an inflight fire, the fire warning indication received was probably due to a malfunction of the fire warning circuit." This accident then became a terrible bit of bad luck as the malfunctioning of the fire warning occurred just as the cockpit was being heated from normal aircraft operations. Following procedures, after the war ning continued, the pilot shut down the engines and he and his radar observer bailed out, leaving the pilotless plane to crash in Walesville. As a relevant aside, another conclusion of the report was that the Air Force’s inspection requirements for the F-94C fire and overheat warning circuits were inadequate. The accident report was completed on August 17, 1954, before Keyhoe wrote Flying Saucer Conspiracy (Jet engine on the ground in Walesville). If he had been given access to the document, or at least was provided with the relevant conclusions by Air Force spokesmen, the confusion over Walesville might never have happened. Instead, given the understandable confidentiality requirements of military accident investigators, Keyhoe and other writers were left to speculate about the cause of the heat in the cockpit and the cause of the crash. In any event, the Walesville case, like that of the death of Thomas Mantell in 1948, should be removed from the UFO files. There was no UFO involved in this tragedy, though there certainly were momentarily unidentified aircraft. 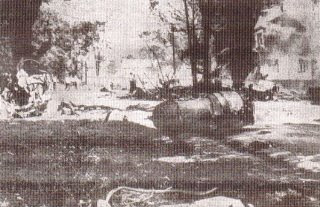 Fawcett and Greenwood in their book, The UFO Cover-up (which originally was titled Clear Intent) wrote, "Without the full details of the crash, it is impossible to determine what caused the jet to malfunction." Then they go on to write, "In the Encyclopedia of UFOs, edited by Ron Story (Doubleday Dolphin, 1980), an entry by Kevin Randle attempts to explain away the Walesville crash as nothing more than an engine fire which poured heat into the cockpit. His "documented evidence" is a news clipping from the New York Times. If the author of the entry had truly been interested in documented evidence other than a newspaper clipping, he would have noticed that the accident report on Walesville contained the following conclusions: ‘Investigation of the wreckage disclosed no in-flight fire. The cause of the malfunction in the fire warning system could not be determined.’(Emphasis in the original.)" Of course, had they bothered to read what I had written, they would have realized that I was quoting Jacques Vallee. The sentence in question is, "Jacques Vallee claimed that the case was documented, and it was even reported in The New York Times." Secondly, documentation available today suggests, as noted earlier, there was no fire, but there was a malfunction in the fire warning system. The pilot, identified as Lt. William E. Atkins, thought that because the cockpit was extremely hot, and because of the warning light, that the aircraft was on fire. Fawcett and Greenwood wrote that "He [the pilot] alerted the radar operator, Lt. Henry Condon [identified in some sources as Coudon], placed the throttle in the idle position, waited four seconds, then stop-cocked the throttle. After waiting another four seconds, Atkins and Condon successfully bailed out." They then added, "So, while we have no specific evidence that the aircraft was attacked by a UFO, the cause of the crash remains unknown to this day. Is it merely coincidence that the jet developed a fault during a UFO chase or...?" Except, everything points to the UFO, or UFOs, being identified as aircraft or the partially deflated balloon. There is no UFO in the classic sense involved in this case. The cause of the accident is the malfunctioning fire warning light and the only thing not explained is the sensation of extreme heat in the cockpit that suggested to the pilot, along with the warning light, that the aircraft was on fire. This is a tragic accident that resulted in the deaths of four civilians on the ground. The Air Force got this one right. It isn’t a UFO case, but an aircraft accident. Now wait. Kevin, I think you're being too quick to accept the USAF's explanation of things. Has anyone talked with the crew of that F-94? We have their names, right? The pilot flew that same ship earlier that same day. He already knew that he had to manually control the cockpit temp. So this should have come as no surprise to him on the second flight of the day. And it was daylight, wasn't it? Could they have visually checked to see if they were on fire (you know, secondary indications) since they didn't even have *primary* indications in the form of a fire warning light? And at night, wouldn't it have been easier to see if they were on fire? Something doesn't add up. Pilots don't just abandon fighter jets because they *think* they're on fire. If anything, they stay with them too long. Now add in the NYT report of the UFO. If "more than 1,000" people were clogging the phone lines to the police, then SOMETHING was happening that can not be attributed to mass hysteria. I know that not *everything* is a conspiracy or coverup, but let's not be too quick to accept the Air Force's story. If the jet was lost because the crew reported unexplained intense heat that was apparently coming from a UFO, and they had to bail out and the jet crashed, do you think the Air Force would admit that? Before I decide one way or the other, I'd love to hear from the pilot and radar operator. If you look again, you'll see that the UFO sighting that clogged the telephone lines happened after the crash. But, there was no visual sighting of a UFO by the crew members, and the intercept missions ended with the unknowns being identified. I just don't think there was a UFO involved in this tragedy at all. 1) The F-18 that crashed recently in California. The pilot had one engine completely out, and the other was having fuel delivery problems. Instead of ditching or diverting, he tried to bring the thing back to base (Mirimar). Only when the plane stalled on approach did the pilot finally bail out. 2) A fellow helicopter pilot blogger relates a story of recovering the remains of a fighter pilot who crashed. Seems that this guy (who had "test pilot credentials") flew through the top of a thunderstorm and the airplane "departed controlled flight" as they say. He stayed with the ship too long, and rode it down to the (small) crater it made. Pilots don't abandon their airplanes willingly. The single engine on the P-80/F-94 is actually mounted *behind* the cockpit, nearly under the vertical fin. It would have been hard for heat from this engine-on-fire to reach the cockpit, considering the speed they were going (even on approach). Okay, news reports place the UFO reports at beginning around 6 p.m. But maybe the Air Force saw something earlier in the day? I find it highly unlikely that they'd divert one of their jets to go intercept a 120 knot (on a good day) C-47. And wait, why would they even be suspicious of the "unidentified" old clunker? It's not like Griffiss had any big Restricted or Prohibited Area around it that the C-47 was penetrating. Upper New York State wasn't covered with highly restricted airspace like, oh, the desert southwest. And didn't military planes file flight plans back then? Didn't they have radios? My dad flew in WWII and he said they certainly *did* have radios back then. So they must've had better ones in 1954 too. No, no, no...something doesn't smell right about the Air Force's story. We know the byline of the NYT UFO story. But was that when the story appeared, or when it was written? Even today we see this sort of confusion on newspaper stories. If the sighting and the crash were both on the same day, then something is VERY coincidental. Like I said, I don't see conspiracies eveywhere, but there are enough questions here to raise my skeptical eyebrow. I don't understand you here. There are facts in this case. Fact: The pilot and radar officer bailed out. They did not ride the plane to the ground. Fact: Radar at Griffiss picked up an unidentified object and the aircraft in the air was asked to intercept and identify. Fact: The aircraft was then diverted to a second intercept, identified the unknown aircraft and returned to the first mission. Fact: The "UFO" sighting was of a balloon but that happened hours after the aircraft crashed. My point here is that this case does not belong in the UFO listings because there was no UFO, in the classic sense involved. I do not know why the crewmen bailed out, but they did. I suspect they thought the aircraft would crash into open country and were horrified to learn it had crashed into Walesville. But we have no argument here. I only say that the case is not a UFO case. I agree with you Kevin. See The Condon Report p.161. The Condon committee accepted the USAF account that there were two separate incidents: the first was a balloon and that no UFO was involved in the airplane crash case. There was no Blue Book file because there was no UFO. Although I have the utmost respect for Donald Keyhoe, based on your presentation it proves to be a good example of how important it is to be sure of your facts before you report them. That being noted, there have been several cases available that seem to imply the very thing that is proved incorrect in this particular case...that is, that a UFO pursuit evolved into an emergency for the pilot, as the cockpit seemed to become excruciatingly hot, as if some type of beam of heat was directed toward them. Given that is the case, it is, at least to a degree,understandable that assumptions were made here. KR: Fact: The pilot and radar officer bailed out. They did not ride the plane to the ground. Yeah, my point was that pilots *don't* easily bail out when they still have control of their planes. Typically, they only leave when control is lost - and sometimes even not then! These guys left early. Really early. Something ain't right. KR: Fact: Radar at Griffiss picked up an unidentified object and the aircraft in the air was asked to intercept and identify. Get real. Then, as now, there are hundreds of "unidentified" aircraft in the air all over the country. Aircraft do not have to file flight plans or even have transponders. I *seriously* doubt that military radar controllers sent out fighters to scrutinize random radar targets, especially lumbering, slow aircraft like the DC-3/C-47. That just doesn't make any sense. If the C-47 was close...let's say 10 miles to the base, the controlles wouldn't need to send a fighter to identify it, they could've used plain old binoculars! Sheesh. KR: Fact: The "UFO" sighting was of a balloon but that happened hours after the aircraft crashed. Ohhhhh, I see. So the thousands of people who saw..."something" in the sky that evening were just mistaking a balloon for a UFO? No wonder the balloon-theory of Roswell has been able to persist for so long. Everything's just a balloon! KR: My point here is that this case does not belong in the UFO listings because there was no UFO, in the classic sense involved. Tell that to all the silly people who called the police, jamming their switchboard, reporting a UFO that was merely a balloon. Umm, what kind of balloon was it again? KR: But we have no argument here. I only say that the case is not a UFO case. You sometimes play fast and loose with "facts," accepting them when it suits you and rejecting them when it does not. For a pilot, you're giving this one the short shrift. I'm not saying anything, one way or the other about this case, OTHER THAN there appears to be more here than meets the eye. It's not like the Air Force hasn't ever altered facts to suit their needs before. And I would seriously question these "facts" before accepting them as gospel. I'm surprised that you so readily do. We agree the pilots bailed out. You say something “ain’t” right here... What evidence do you bring to the table? The pilot said the cockpit heated and there were indications of a fire warning light. They thought the airplane was on fire. But, in the end, they bailed out. I offer no criticism of them for their actions, only point out that they did bail out. If you suspect something else, please offer evidence of it. You seriously “doubt” that the controllers would have diverted the aircraft to an active air defense mission, but you have no evidence that they didn’t. You say there are lots of unidentified targets on radar from those aircraft flying without benefit of flight plan or without transponder (I’ll add, especially in 1954), but that doesn’t translate into unidentified targets on the radar scope. The controllers saw something there that worried them and asked an aircraft to check it out. You then invent facts not in evidence and suggest the controllers could have identified a C-47 as such if it was ten miles away, but you don’t know that... clouds could have obscured the view, not to mention other things. So the aircraft was diverted to take a look. It’s not as if they scrambled the aircraft... it was available. You miss the point about the balloon... this was an event that took place hours AFTER the fighter intercept and was not part of the original story. It doesn’t matter if this was a spacecraft or not because it had nothing to do with the earlier tragedy. Others have combined two events into a super space spectacular because they believed the events linked. The number of witnesses who misidentified an object is irrelevant. Years ago hundreds called local stations to ask about a spacecraft landing on the moon. It was Venus. But it wasn’t silly people reporting a UFO but citizens wondering what was hovering in the sky. Besides, UFO doesn’t translate into alien craft. And now I’m the bad guy “playing fast and loose with the facts...” But what facts have you offered to counter anything I printed here? You seem annoyed that I reported the pilots bailed out, though they did. You seem irritated that I reported people called the local media and sheriff about a balloon that has nothing to do with the case. I’m not sure what you’re suggesting here. But the facts are the facts and unless or until you can provide something else then all we have from you is speculation. They have no evidence the aircraft was attacked by a UFO... so, where does this leave us? I suggest it leaves us without a UFO (meaning spacecraft) and with a terrible aircraft accident. Again, I do not understand your anger here. I've found this interesting. My father was farming a field near by and told me a story about a glowing ball, jet, and having a severe sunburn like reaction days later. He also mentioned that he's seen a similar UFO years later. I live in Waleville NY and my father witnessed the pilots ejecting from the aircraft. My uncle had claimed that he had previously seen a UFO following the Oriskany Creek line. I grew up in Walesvile. My grandmother rushed an injured girl to the hospital. My father raced home from work to be sure the family was safe. Our roof leaked because of debris from the plane. My uncle was driving right behind the staionwagon that was hit by the plane.My father and other residents saw peculiar events in the sky before and after the crash. If you grew up in Walesville, you would believe the plane was chasing the UFO. I am doing research on this event, can you please contact me at glenf77@aol.com. I would really like to speak with you and include you in my documentation. I find it strange that nothing more is mentioned about the second F-94 or any information on what they allegedly saw.